Edarbyclor drew the industry’s attention by obtaining insurance coverage, simultaneously with the market release. Kim Yong-jin, a professor at the cardiology department of Seoul National University Hospital, speaks during a news conference, organized by Takeda Pharmaceuticals Korea and Dong-A ST, at Four Seasons Hotel Seoul on Tuesday. Insurance coverage for Edarbyclor is available for essential hypertension patients whose blood pressure is not controlled by the monotherapy using azilsartan medoxomil, and hypertensive patients who need a combo therapy to reach the target blood pressure. 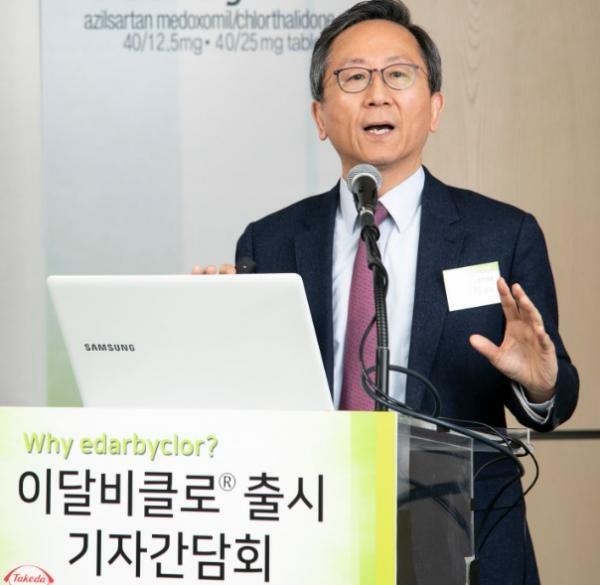 Kim Yong-jin, a professor at the cardiology department of Seoul National University Hospital, raised hope for Edarbiclor that it would become a useful treatment option in the hypertension combo market. His comments came at a news conference, organized by Takeda Pharmaceuticals Korea and Dong-A ST, at Four Seasons Hotel Seoul on Tuesday. As patients increasingly use combo treatments, the new combo drug mixing ARB and chlorthalidone will help them achieve the goal, he added. According to Takeda Pharmaceuticals Korea, edarbi as an ARB reduces blood pressure by suppressing angiotensin II receptor, the hormone that increases blood pressure. Lee emphasized that over 87 percent of the patients treated with Edarbiclor successfully reduced the blood pressure at the target level. The new combo treatment also showed safety similar to the placebo and the olmesartan medoxomil+hydrochlorothiazide combo in a study on over 1,000 patients, he added. Takeda Korea and Dong-A ST jointly carry out local sales and marketing for Edarbiclor. The product comes in two dosages – 40/12.5mg and 40/25mg. Regardless of dosage, the drug is priced at 439 won ($0.39) per tablet.